And now I’ve got caught up with last week’s comics. I can get to readying for this coming Sunday looking at … so far … nine comic strips that made the preliminary cut. Whimper. This time the name does mean something. Thaves’s Frank and Ernest for the 31st complains about not being treated as a “prime number”. There’s a lot of linguistic connotation gone into this strip. The first is the sense that to be a number is to be stripped of one’s humanity, to become one of a featureless horde. Each number is unique, of course; Iva Sallay’s Find the Factors page each day starts with some of the features of each whole number in turn. But one might look at, oh, 84,644 and not something very different from 84,464. Thaves’s Frank and Ernest for the 31st of May, 2018. In the past I’ve gone out trying to find and print Thaves’s first name, on the grounds that I should fully credit people. I’m coming around on this, first because I keep forgetting his first name and looking it up every time is tiresome. But more important, if Thaves wants to be known simply as ‘Thaves’ what am I doing arguing that? Is there a different Thaves, possibly his evil twin, producing another comic strip named Frank and Ernest that I have to make clear I’m not talking about? So that’s my level of overthinking these captions right now. And yet there’s the idea that there are prime numbers, celebrities within the anonymous counting numbers. The name even says it; a prime something is especially choice. And we speak of prime numbers as somehow being the backbone of numbers. This reflects that we find unique factorizations to be a useful thing to do. But being a prime number doesn’t make a number necessarily better. There are reasons most (European) currencies, before decimalization, divided their currency unit into 20 parts of 12 parts each. And nobody divided them into 19 parts of 13 parts each. As often happens, whether something is good depends on what you’re hoping it’s good for. Nate Fakes’s Break of Day for the 1st of June, 2018. Sure, but what do you do for the sequel? No, τ is not a thing. Nate Fakes’s Break of Day for the 1st of June is more or less the anthropomorphized numerals installment for the week. It’s also a bit of wordplay, so, good on them. There’s not so many movies about mathematics. Darren Aronofsky’s Pi , Ron Howard’s A Beautiful Mind , and Theodore Melfi’s Hidden Figures are the ones that come to mind, at least in American cinema. And there was the TV detective series Numbers . It seems odd that there wasn’t, like, some little studio prestige thing where Paul Muni played Évariste Galois back in the day. But a lot of the mathematical process isn’t cinematic. People scribbling notes, typing on a computer, or arguing about something you don’t understand are all hard to make worth watching. And the parts that anyone could understand — obsession, self-doubt, arguments over priority, debates about implications — are universal to any discovery or invention. Note that the movies listed are mostly about people who happen to be doing mathematics. You could change the specialties to, say, chemical engineering without altering the major plot beats. Well, Pi would need more alteration. But you could make it about any process that seems to offer reliable forecasting in a new field. Greg Evans’s Luann Againn for the 1st of June, 2018. It originally ran the 1st of June, 1990. Greg Evans’s Luann Againn for the 1st takes place in mathematics class. The subject doesn’t matter for the joke. It could be anything that doesn’t take much word-balloon space but that someone couldn’t bluff their way through. Ted Shearer’s Quincy for the 7th of April, 1979 and reprinted the 1st of June, 2018. I get why Quincy would figure he’d grow up to be a very tall accountant, but why does he just assume he’d be a very short basketball player? Isn’t it as easy to imagine you’ll grow up to be a typically-sized basketball player? Does he know something we don’t? Ted Shearer’s Quincy for the 7th of April, 1979 has Quincy thinking what he’ll do with his head for figures. He sees accounting as plausible. Good for him. Society always needs accountants. And they probably do more of society’s mathematics than the mathematicians do. Bill Abbott’s Spectickles for the 1st of June, 2018. So, is this all the characters that have to be typed in, or is it one of those annoying things where you have to solve the puzzle to get the password? Bill Abbott’s Spectickles for the 1st features the blackboard-full-of-mathematics to represent the complicated. It shows off the motif that an advanced mathematical formula will be a long and complicated one. This has good grounds behind it. If you want to model something interesting that hasn’t been done before, chances are it’s because you need to consider many factors. And trying to represent them will be clumsily done. It takes reflection and consideration and, often, new mathematical tools to make a formula pithy. Famously, James Clerk Maxwell introduced his equations about electricity and magnetism as a set of twenty equations. By 1873 Maxwell, making some use of quaternions, was able to reduce this to eight equations. Oliver Heaviside, in the late 19th century, used the still-new symbols of vector mechanics. This let him make an attractive quartet. We still see that as the best way to describe electromagnetic fields. As with writing, much of mathematics is rewriting. 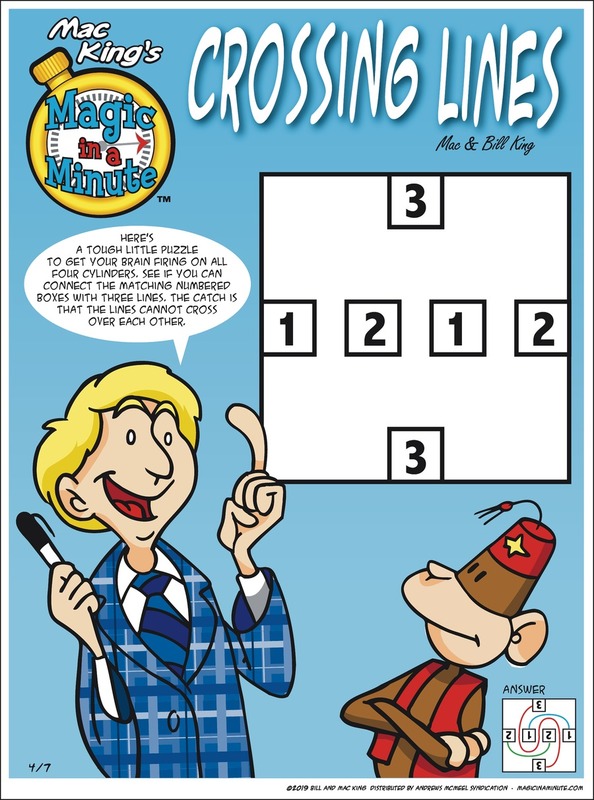 And it’s not always fair to say that the gods mock any plans made by humans, but Comic Strip Master Command has been doing its best to break me of reading and commenting on any comic strip with a mathematical theme. I grant that I could make things a little easier if I demanded more from a comic strip before including it here. But even if I think a theme is slight that doesn’t mean the reader does, and it’s easy to let the eye drop to the next paragraph if the reader does think it’s too slight. The anthology nature of these posts is part of what works for them. 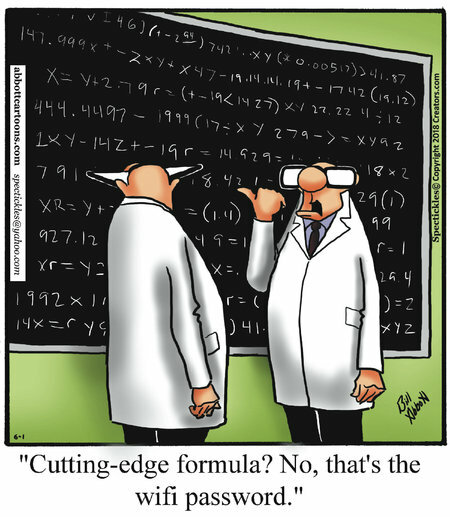 And then sometimes Comic Strip Master Command sends me a day like last Sunday when everybody was putting in some bit of mathematics. There’ll be another essay on the past week’s strips, never fear. But today’s is just for the single day. Susan Camilleri Konar’s Six Chix for the 11th illustrates the Lemniscate Family. The lemniscate is a shape well known as the curve made by a bit of water inside a narrow tube by people who’ve confused it with a meniscus. An actual lemniscate is, as the chain of pointing fingers suggests, a figure-eight shape. You get — well, I got — introduced to them in prealgebra. They’re shapes really easy to describe in polar coordinates but a pain to describe in Cartesian coordinates. There are several different kinds of lemniscates, each satisfying slightly different conditions while looking roughly like a figure eight. If you’re open to the two lobes of the shape not being the same size there’s even a kind of famous-ish lemniscate called the analemma. This is the figure traced out by the sun if you look at its position from a set point on the surface of the Earth at the same clock time each day over the course of the year. That the sun moves north and south from the horizon is easy to spot. That it is sometimes east or west of some reference spot is a surprise. It shows the difference between the movement of the mean sun, the sun as we’d see it if the Earth had a perfectly circular orbit, and the messy actual thing. Dr Helmer Aslasken has a fine piece about this, and how it affects when the sun rises earliest and latest in the year. Susan Camilleri Konar’s Six Chix for the 11th of February, 2018. It’s not really worse than some of the Carioid Institute dinners. There’s also a thing called the “polynomial lemniscate”. This is a level curve of a polynomial. That is, what are all the possible values of the independent variable which cause the polynomial to evaluate to some particular number? This is going to be a polynomial in a complex-valued variable, in order to get one or more closed and (often) wriggly loops. A polynomial of a real-valued variable would typically give you a boring shape. There’s a bunch of these polynomial lemniscates that approximate the boundary of the Mandelbrot Set, that fractal that you know from your mathematics friend’s wall in 1992. Mark Anderson’s Andertoons took care of being Mark Anderson’s Andertoons early in the week. It’s a bit of optimistic blackboard work. Lincoln Pierce’s Big Nate features the formula for calculating the wind chill factor. Francis reads out what is legitimately the formula for estimating the wind chill temperature. I’m not going to get into whether the wind chill formula makes sense as a concept because I’m not crazy. The thinking behind it is that a windless temperature feels about the same as a different temperature with a particular wind. How one evaluates those equivalences offers a lot of room for debate. The formula as the National Weather Service, and Francis, offer looks frightening, but isn’t really hard. It’s not a polynomial, in terms of temperature and wind speed, but it’s close to that in form. The strip is rerun from the 15th of February, 2009, as Lincoln Pierce has had some not-publicly-revealed problem taking him away from the comic for about a month and a half now. Jim Scancarelli’s Gasoline Alley included a couple of mathematics formulas, including the famous E = mc2 and the slightly less famous πr2, as part of Walt Wallet’s fantasy of advising scientists and inventors. (Scientists have already heard both.) There’s a curious stray bit in the corner, writing out 6.626 x 102 x 3 that I wonder about. 6.626 is the first couple digits of Planck’s Constant, as measured in Joule-seconds. (This is h, not h-bar, I say for the person about to complain.) It’d be reasonable for Scancarelli to have drawn that out of a physics book or reference page. But the exponent is all wrong, even if you suppose he mis-wrote 1023. It should be 6.626 x 10-34. So I don’t know whether Scancarelli got things very garbled, or if he just picked a nice sciencey-looking number and happened to hit on a significant one. (There’s enough significant science numbers that he’d have a fair chance of finding something.) The strip is a reprint from the 4th of February, 2007, as Jim Scancarelli has been absent for no publicly announced reason for four months now. Greg Evans and Karen Evans’s Luann is not perfectly clear. But I think it’s presenting Gunther doing mathematics work to support his mother’s contention that he’s smart. There’s no working out what work he’s doing. But then we might ask how smart his mother is to have made that much food for just the two of them. Also that I think he’s eating a potato by hand? … Well, there are a lot of kinds of food that are hard to draw. 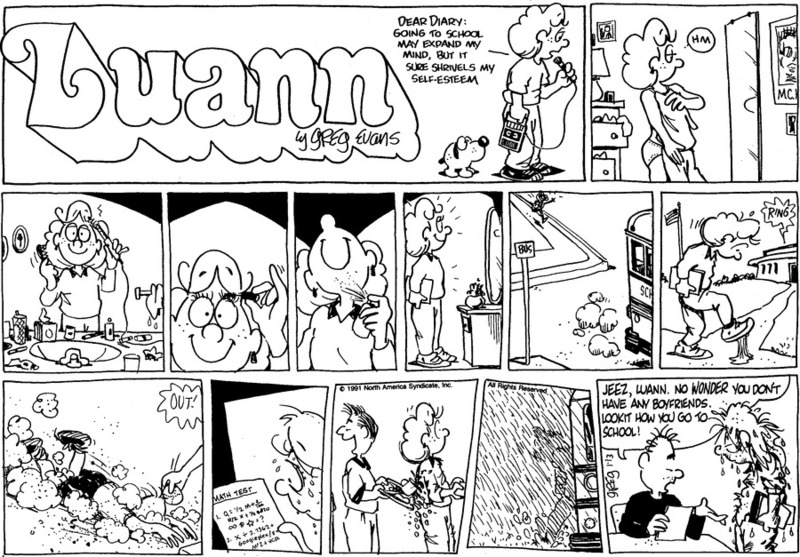 Greg Evans’s Luann Againn reprints the strip from the 11th of February (again), 1990. It mentions as one of those fascinating things of arithmetic an easy test to see if a number’s a multiple of nine. There are several tricks like this, although the only ones anybody can remember are finding multiples of 3 and finding multiples of 9. Well, they know the rules for something being a multiple of 2, 5, or 10, but those hardly look like rules, and there’s no addition needed. Similarly with multiples of 4. Modular arithmetic underlies all these rules. Once you know the trick you can use it to work out your own add-up-the-numbers rules to find what numbers are multiples of small numbers. Here’s an example. Think of a three-digit number. Suppose its first digit is ‘a’, its second digit ‘b’, and its third digit ‘c’. So we’d write the number as ‘abc’, or, 100a + 10b + 1c. What’s this number equal to, modulo 9? Well, 100a modulo 9 has to be equal to whatever a modulo 9 is: (100 a) modulo 9 is (100) modulo 9 — that is, 1 — times (a) modulo 9. 10b modulo 9 is (10) modulo 9 — again, 1 — times (b) modulo 9. 1c modulo 9 is … well, (c) modulo 9. Add that all together and you have a + b + c modulo 9. If a + b + c is some multiple of 9, so must be 100a + 10b + 1c. The rules about whether something’s divisible by 2 or 5 or 10 are easy to work with since 10 is a multiple of 2, and of 5, and for that matter of 10, so that 100a + 10b + 1c modulo 10 is just c modulo 10. You might want to let this settle. Then, if you like, practice by working out what an add-the-digits rule for multiples of 11 would be. (This is made a lot easier if you remember that 10 is equal to 11 – 1.) And if you want to show off some serious arithmetic skills, try working out an add-the-digits rule for finding whether something’s a multiple of 7. Then you’ll know why nobody has ever used that for any real work. J C Duffy’s Lug Nuts plays on the equivalence people draw between intelligence and arithmetic ability. Also on the idea that brain size should have something particularly strong link to intelligence. Really anyone having trouble figuring out 15% of $10 is psyching themselves out. They’re too much overwhelmed by the idea of percents being complicated to realize that it’s, well, ten times 15 cents. 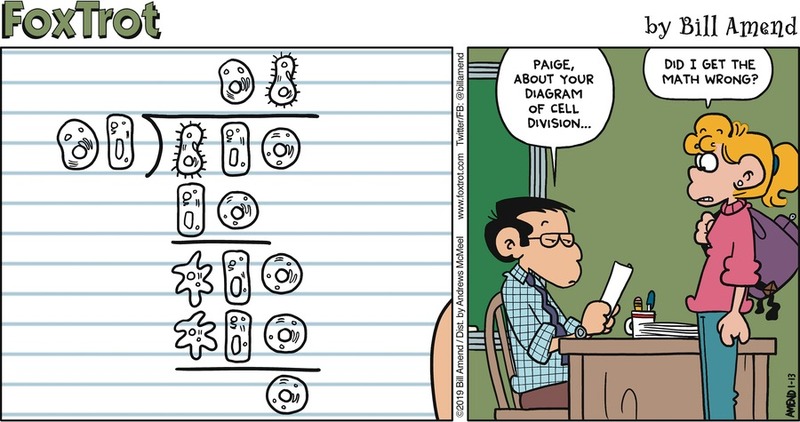 And now finally I can close out last week’s many mathematically-themed comic strips. I had hoped to post this Thursday, but the Why Stuff Can Orbit supplemental took up my writing energies and eventually timeslot. This also ends up being the first time I’ve had one of Joe Martin’s comic strips since the Houston Chronicle ended its comics pages and I admit I’m not sure how I’m going to work this. I’m also not perfectly sure what the comic strip means. 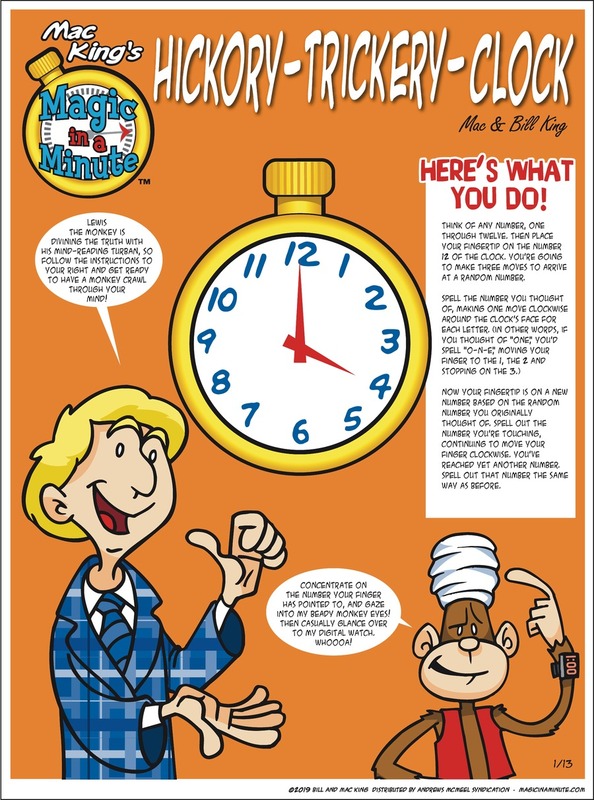 So Joe Martin’s Mister Boffo for the 1st of June seems to be about a disastrous mathematics exam with a kid bad enough he hasn’t even got numbers exactly to express the score. Also I’m not sure there is a way to link to the strip I mean exactly; the archives for Martin’s strips are not … organized the way I would have done. Well, they’re his business. So Joe Martin’s Mister Boffo for the 1st of June, 2017. The link is probably worthless, since I can’t figure out how to work its archives. Good luck yourselves with it. Greg Evans’s Luann Againn for the 1st reruns the strip from the 1st of June, 1989. It’s your standard resisting-the-word-problem joke. On first reading the strip I didn’t get what the problem was asking for, and supposed that the text had garbled the problem, if there were an original problem. That was my sloppiness is all; it’s a perfectly solvable question once you actually read it. J C Duffy’s Lug Nuts for the 1st — another day that threatened to be a Reading the Comics post all on its own — is a straggler Pi Day joke. It’s just some Dadaist clowning about. Doug Bratton’s Pop Culture Shock Therapy for the 1st is a wordplay joke that uses word problems as emblematic of mathematics. I’m okay with that; much of the mathematics that people actually want to do amounts to extracting from a situation the things that are relevant and forming an equation based on that. This is what a word problem is supposed to teach us to do. Zach Weinersmith’s Saturday Morning Breakfast Cereal for the 1st — maybe I should have done a Reading the Comics for that day alone — riffs on the idle speculation that God would be a mathematician. It does this by showing a God uninterested in two logical problems. The first is the question of whether there’s an odd perfect number. Perfect numbers are these things that haunt number theory. (Everything haunts number theory.) It starts with idly noticing what happens if you pick a number, find the numbers that divide into it, and add those up. For example, 4 can be divided by 1 and 2; those add to 3. 5 can only be divided by 1; that adds to 1. 6 can be divided by 1, 2, and 3; those add to 6. For a perfect number the divisors add up to the original number. Perfect numbers look rare; for a thousand years or so only four of them (6, 28, 496, and 8128) were known to exist. Some miscellaneous other things we know about an odd perfect number, other than whether any exist: if there are odd perfect numbers, they’re not divisible by 105. They’re equal to one more than a whole multiple of 12. They’re also 117 more than a whole multiple of 468, and they’re 81 more than a whole multiple of 324. They’ve got to have at least 101 prime factors, and there have to be at least ten distinct prime factors. There have to be at least twelve distinct prime factors if 3 isn’t a factor of the odd perfect number. If this seems like a screwy list of things to know about a thing we don’t even know exists, then welcome to number theory. The beard question I believe is a reference to the logician’s paradox. This is the one postulating a village in which the village barber shaves all, but only, the people who do not shave themselves. Given that, who shaves the barber? It’s an old joke, but if you take it seriously you learn something about the limits of what a system of logic can tell you about itself. Bud Blake’s Tiger rerun for the 2nd of June, 2017. Bonus arithmetic problem: what’s the latest time that this could be? Also, don’t you like how the dog’s tail spills over the panel borders twice? I do. Bud Blake’s Tiger rerun for the 2nd has Tiger’s arithmetic homework spill out into real life. This happens sometimes. George Herriman’s Krazy Kat for the 10th of July, 1939 and rerun the 2nd of June, 2017. I realize that by contemporary standards this is a very talky comic strip. But read Officer Pupp’s dialogue, particularly in the second panel. It just flows with a wonderful archness. George Herriman’s Krazy Kat for the 10th of July, 1939 was rerun the 2nd of June. I’m not sure that it properly fits here, but the talk about Officer Pupp running at 60 miles per hour and Ignatz Mouse running forty and whether Pupp will catch Mouse sure reads like a word problem. Later strips in the sequence, including the ways that a tossed brick could hit someone who’d be running faster than it, did not change my mind about this. Plus I like Krazy Kat so I’ll take a flimsy excuse to feature it. It was another of those curious weeks when Comic Strip Master Command didn’t send quite enough comics my way. Among those they did send were a couple of strips in pairs. I can work with that. Samson’s Dark Side Of The Horse for the 26th is the Roman Numerals joke for this essay. I apologize to Horace for being so late in writing about Roman Numerals but I did have to wait for Cecil Adams to publish first. In Jef Mallett’s Frazz for the 26th Caulfield ponders what we know about Pythagoras. It’s hard to say much about the historical figure: he built a cult that sounds outright daft around himself. But it’s hard to say how much of their craziness was actually their craziness, how much was just that any ancient society had a lot of what seems nutty to us, and how much was jokes (or deliberate slander) directed against some weirdos. What does seem certain is that Pythagoras’s followers attributed many of their discoveries to him. And what’s certain is that the Pythagorean Theorem was known, at least a thing that could be used to measure things, long before Pythagoras was on the scene. I’m not sure if it was proved as a theorem or whether it was just known that making triangles with the right relative lengths meant you had a right triangle. Greg Evans’s Luann Againn for the 28th of February — reprinting the strip from the same day in 1989 — uses a bit of arithmetic as generic homework. It’s an interesting change of pace that the mathematics homework is what keeps one from sleep. I don’t blame Luann or Puddles for not being very interested in this, though. Those sorts of complicated-fraction-manipulation problems, at least when I was in middle school, were always slogs of shuffling stuff around. They rarely got to anything we’d like to know. Jef Mallett’s Frazz for the 1st of March is one of those little revelations that statistics can give one. Myself, I was always haunted by the line in Carl Sagan’s Cosmos about how, in the future, with the Sun ageing and (presumably) swelling in size and heat, the Earth would see one last perfect day. That there would most likely be quite fine days after that didn’t matter, and that different people might disagree on what made a day perfect didn’t matter. Setting out the idea of a “perfect day” and realizing there would someday be a last gave me chills. It still does. Richard Thompson’s Poor Richard’s Almanac for the 1st and the 2nd of March	have appeared here before. But I like the strip so I’ll reuse them too. They’re from the strip’s guide to types of Christmas trees. The Cubist Fur is described as “so asymmetrical it no longer inhabits Euclidean space”. Properly neither do we, but we can’t tell by eye the difference between our space and a Euclidean space. “Non-Euclidean” has picked up connotations of being so bizarre or even horrifying that we can’t hope to understand it. In practice, it means we have to go a little slower and think about, like, what would it look like if we drew a triangle on a ball instead of a sheet of paper. The Platonic Fir, in the 2nd of March strip, looks like a geometry diagram and I doubt that’s coincidental. It’s very hard to avoid thoughts of Platonic Ideals when one does any mathematics with a diagram. We know our drawings aren’t very good triangles or squares or circles especially. 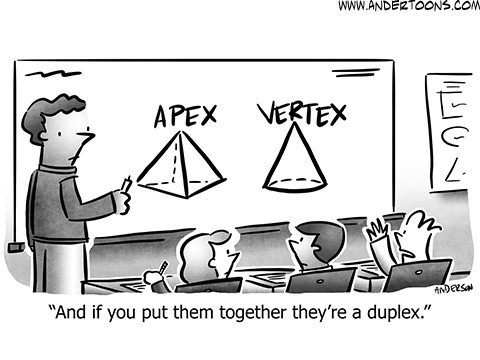 And three-dimensional shapes are worse, as see every ellipsoid ever done on a chalkboard. But we know what we mean by them. And then we can get into a good argument about what we mean by saying “this mathematical construct exists”. Mark Litzler’s Joe Vanilla for the 3rd uses a chalkboard full of mathematics to represent the deep thinking behind a silly little thing. I can’t make any of the symbols out to mean anything specific, but I do like the way it looks. It’s quite well-done in looking like the shorthand that, especially, physicists would use while roughing out a problem. That there are subscripts with forms like “12” and “22” with a bar over them reinforces that. I would, knowing nothing else, expect this to represent some interaction between particles 1 and 2, and 2 with itself, and that the bar means some kind of complement. This doesn’t mean much to me, but with luck, it means enough to the scientist working it out that it could be turned into a coherent paper. Bill Holbrook’s On The Fastrack for the 3rd of March, 2017. Fi’s dress isn’t one of those … kinds with the complicated pattern of holes in it. She got it torn while trying to escape the wedding and falling into the basement. Bill Holbrook’s On The Fastrack is this week about the wedding of the accounting-minded Fi. And she’s having last-minute doubts, which is why the strip of the 3rd brings in irrational and anthropomorphized numerals. π gets called in to serve as emblematic of the irrational numbers. Can’t fault that. I think the only more famously irrational number is the square root of two, and π anthropomorphizes more easily. Well, you can draw an established character’s face onto π. The square root of 2 is, necessarily, at least two disconnected symbols and you don’t want to raise distracting questions about whether the root sign or the 2 gets the face. That said, it’s a lot easier to prove that the square root of 2 is irrational. Even the Pythagoreans knew it, and a bright child can follow the proof. A really bright child could create a proof of it. To prove that π is irrational is not at all easy; it took mathematicians until the 19th century. And the best proof I know of the fact does it by a roundabout method. We prove that if a number (other than zero) is rational then the tangent of that number must be irrational, and vice-versa. And the tangent of π/4 is 1, so therefore π/4 must be irrational, so therefore π must be irrational. I know you’ll all trust me on that argument, but I wouldn’t want to sell it to a bright child. Bill Holbrook’s On The Fastrack for the 4th of March, 2017. I feel bad that I completely forgot Carl had a kid and that the face on the x doesn’t help me remember anything. Holbrook continues the thread on the 4th,	extends the anthropomorphic-mathematics-stuff to call people variables. There’s ways that this is fair. We use a variable for a number whose value we don’t know or don’t care about. A “random variable” is one that could take on any of a set of values. We don’t know which one it does, in any particular case. But we do know — or we can find out — how likely each of the possible values is. We can use this to understand the behavior of systems even if we never actually know what any one of it does. You see how I’m going to defend this metaphor, then, especially if we allow that what people are likely or unlikely to do will depend on context and evolve in time.